Posted on December 29, 2011 February 25, 2013 by Doug Eisenstark, L.Ac. This is really more about a “side-effect” than an interaction. Long-term high-dose use of gan cao (Licorice root) is associated with changes in how the kidneys excrete water. If you retain more water, it is possible for blood pressure to rise. Reports of this issue describe dosages of 273 to 546 mg per day [source], and 1,000 mg per day [source]. The typical dosage of gan cao (Licorice root) used in Eagle herbs formulas varies between 10 – 20 mg per day. Not too much comparatively speaking. This is consistent with traditional uses of this herb. 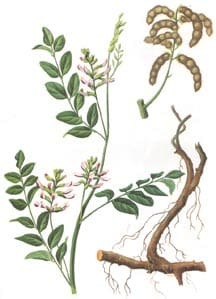 There are forms of gan cao that have a particular component of gan cao (licorice root) missing, however these “deglycyrrhizinated” forms may also be missing therapeutic actions. In the future, Eagle Herbs may transition to using the deglycyrrhizinated version of this herb, but for now the jury remains out. This second mention of blood pressure is the same as mentioned above.